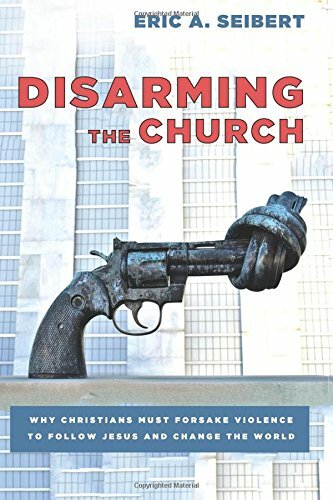 Eric Seibert has a new book out called Disarming the Church which I which I received a review copy of. I've always appreciated how Eric's books challenge readers to really think through difficult issues. In other words, rather than spoon feeding us the answers, his books do the true work of a teacher, which is getting his audience to think, and providing us with the tools to do that. His previous books (Disturbing Divine Behavior and The Violence of Scripture) helped us grapple with the problem of violence in the Bible, and his latest book (Disarming the Church) challenges us to take up the nonviolent way of Jesus. This is an incredibly important and relevant topic today. We have an epidemic of gun violence and mass shootings in this country, and our elected officials (i.e. the GOP) refuse to pass reasonable gun safety legislation to stop it. If you are looking for a way to reduce deaths due to gun violence and to protect the lives of our school kids, let's vote them out! Eric then proceeds to tell many stories of how people have defused potentially violent situations in nonviolent ways, each time looking at what was going on and what we can learn from these stories. I very much appreciate this, and shared many of the stories in Eric's book with my family. We were inspired by the examples, and talked together about it. One story that I was particularly moved by was of an escaped prisoner who threatened a couple in their home with a shotgun. The woman ended up disarming him with love, and the convict later became a Christian as a result (you’ll need to read the story yourself in Eric’s book for the details!) The take-away of the convict, and my take-away too, was that she exhibited “real Christianity...no fear.” People often view nonviolence as a way to avoid conflict, but it is not. It is a way to address conflict. It requires bravery, fearlessness. Perfect love casts out fear. The kind of Christianity that clings to guns is a faith engulfed in fear. Fear is what must be exorcised from the church, and true love—Jesus-shaped love—is what casts it out. Eric mentions that his wife is a therapist, and tells how he learned from her how patients who become violent are restrained in a way that does not harm them, either physically or emotionally. This is one example of how the mental heath field has moved in the direction of finding nonviolent ways to deal with conflict and danger that seek to maintain a patient’s agency and dignity. In other words, it’s an example of change on an institutional and systemic level. Mental health professionals have developed policies, protocols, and best practices that have generally moved in the direction of nonviolence. This is the element that I would like to add to his many helpful personal examples. While I very much appreciate the focus in his book on how we as individuals can practice nonviolence in our lives, I also want to suggest that we also need to work towards systemic change. In other words, we could learn a lot from looking at how various professionals implement nonviolent strategies in their work to resolve conflict. We could look at how couples counselors or mediators work. We could look to the field of international diplomacy. We could look to the growing study of conflict resolution. We could look at the tools of hostage negotiators. Speaking of that last one, the tools of hostage negotiators have been shown to help police to deescalate dangerous situations in ways that statistically keep them safe and everyone else safe--if they receive that training. However, that training often does not take place, and as we have seen from the Black Lives Matter movement, police are far too quick to kill people of color, rather than deescalating a situation. In general our criminal justice system functions as if we knew nothing about how humans function from the mental health field, as if we were in the middle ages. As a result, it is, as a system, very prone to violence, in the sense that Eric defines violence in his book as “physical, emotional, or psychological harm done to a person by an individual(s), institution, or structure that results in serious injury, oppression, or death.” We are in deep need of reform in our criminal justice system, taking it in the direction of nonviolence, treating people with love leading to rehabilitation and reconciliation. But the main point I wanted to add is the idea of taking the tools from these many fields that are using nonviolent means to resolve conflict and learning from them. While I totally agree with Wink’s above statement, at the same time, as Gene Sharp has convincingly demonstrated, those participating in nonviolent resistance do not necessarily need to have “love in their hearts” (i.e. good will, empathy, etc.) towards their oppressors in order to be effective as a moral force for change. What matters is not their inner feelings, but their actions. This is incidentally a point made by Jesus constantly. While Evangelical Christianity tends to focus on what is “in your heart,” Jesus understood love in terms of action, in terms of what we do: “As you do it unto the least of these you do it unto me,” “do unto others as you would have them do it unto you,” and so on. So when Jesus says, "If you love me you will obey my commands, and this is my command: love each other" he is understanding love in terms of action not feeling. If you love me, Jesus says, you will do what I command, which is to love. Jesus defines love as what we do. Jesus says this to those who call him lord (and I'll add: to those who say they "love Jesus in their heart") but do not do unto the least of these in love: "I do not know you, depart from me into darkness prepared for the devil." He literally says to those so-called Christians, "I do not know you, go to hell!" I really don't think Jesus could possibly make himself any more clear here. Knowing Jesus is not about loving him in your heart, it is about following Jesus in how he loves. That's what makes you his disciple or not. And if you want to go there, that's what determines whether Jesus will invite you to him with the words "well done by faithful servant" or whether he tells you to go... somewhere else. What we therefore need is training in how to do, how to act, how to respond nonviolently, and we need to practice that training. That’s true if you are walking down the Selma bridge with Martin Luther King Jr., and it’s true if you are a therapist working on a locked psych ward, and it’s true if you are a hostage negotiator. We could all benefit from incorporating some of that training and tools into our own lives, not to mention incorporating them into institutions that currently lack them. That’s all for now. I’ll likely have more to say as I continue to read. Eric, let me say that I am grateful for your book, for you sharing your thoughts on how you are working out what it means to follow in the nonviolent way of Jesus. As I try to follow in that same way, your book and your witness are a welcome companion. Our world needs voices like yours, and I hope many people will pick up a copy of Disarming the Church.